Edward de Vere, the 17th Earl of Oxford, was an English lyric poet, favoured member of Queen Elizabeth’s court, song writer and playwright. Although he was popular as a courtier his often reckless nature meant that he was never taken seriously enough to be offered any position of responsibility in government. Literary critics espoused the theory during the 19th century that he, along with scores of others, may have written some (or even all) of William Shakespeare’s works. Oxford, along with Christopher Marlowe, the Earl of Derby and Sir Francis Bacon were prime candidates for this. 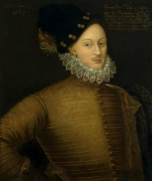 He was born into extremely privileged circumstances on the 12th April 1550 at Hedingham Castle in Essex, the son of the 16th Earl, John de Vere. At the age of 12 he lost his father and then found himself in the enviable position of being a ward of the Queen, living in principal advisor Sir William Cecil’s house. The family had long-held connections with Her Majesty so it was inevitable that she should welcome Edward into her inner sanctum. His education was provided by two colleges in Cambridge: Queens’ and then St John’s. He grew up with a love of horsemanship and exhibited a great talent for writing from a young age. He composed a number of romantic poems and it is believed that he was the first to do so in the Elizabethan court. He became a patron of a number of disciplines of the performing arts and wrote plays himself, though none of these survived into modern times. During his 30s he fell out of favour at court having made one of the Queen’s maids of honour pregnant and was thrown into the Tower of London for a time, along with the woman and her infant child. He was eventually released and forgiven but his status was never the same again. De Vere seemed incapable of managing his finances properly, entering into ill-advised land sales for a quick profit. These left him in serious financial trouble and he was only rescued when the Queen allowed him an annuity of £1,000. When he died in 1604 the inherited estates were long gone. At best, his income would have been around a million pounds per year in today’s terms, simply based on the properties in his possession. Many of de Vere’s poems were turned into love songs and he built up a reputation for such compositions. He was generally considered to be Queen Elizabeth’s favourite “courtier poet” and it seems incredible that a man with so much in his favour should squander so much of his wealth and prestige. Not all critics wrote good things about him though with descriptions of his work such as “astonishingly uneven in quality” being a typical example. Whether he did, or did not, write some of the work attributed to Shakespeare is still open to conjecture but there is no doubt that his name is etched firmly into literary history. Edward de Vere died on the 24th June 1604 at the age of 54.